Ever since my parents decided on a weekend trip to Lake Foster, my dad has NOT stopped talking about pedal boats. He was super excited because when he was a kid, his family used to spend whole summers at Lake Foster. He and his brother loved to rent pedal boats, which are like this weird boat/bike combo where you sit in it and pedal with your feet to make it go. It sounded like a lot of unnecessary work to me. Sorry, but if I have to be stuck on a boat, I’d rather it be one of those fancy, humongous cruise ships with a floating water park, like in the television commercials! I finally got my dad to (sort of) shut up about the pedal boats by promising I would try it with him. So, once we arrived at the lake, Mom put on her noise-cancelling headphones and settled on a nearby bench to read her book while we went to rent a boat. Brianna was fascinated with the boat as soon as she saw it. However, I was NOT impressed. Mostly because it was so old it looked like it was probably the same one my dad took out when he was my age. The boat rental guy started to give my dad instructions, but Dad just waved him off and bragged that he was an old pro at pedal boats. Even though he hadn’t been in one in thirty years! Dad helped Brianna into the boat. But, when I stepped forward, he stopped me and made me hand over my cell phone. “Lake Foster is a CELL PHONE FREE ZONE! 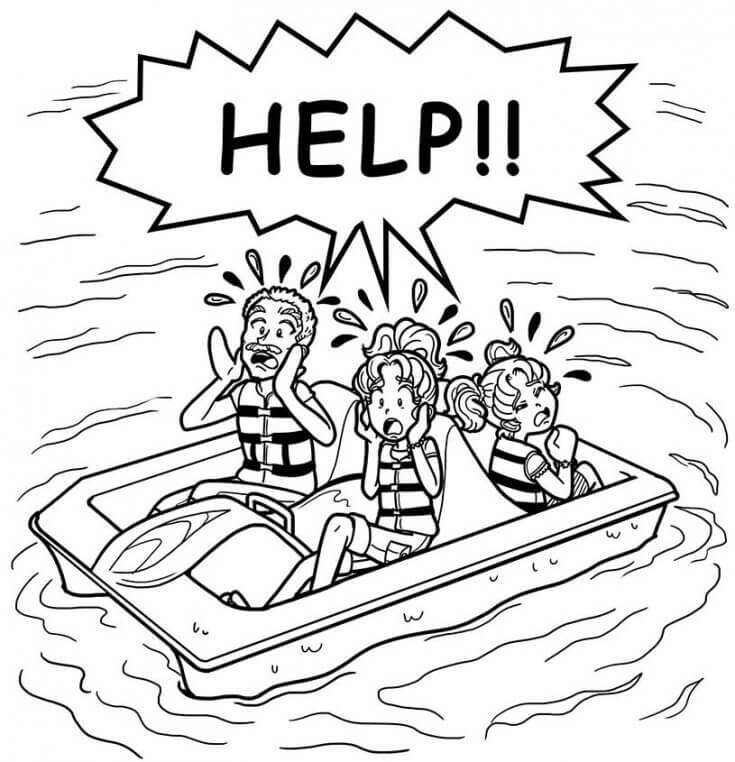 !” he announced, just as the boat rental guy got a text message. WHATEVER! I handed my phone to my mom and got in the boat. Besides, I figured I was going to be too busy having fun and pedaling around the lake to text anyone. The boat rental guy shoved us out into the lake. Brianna was all excited to pedal, so I let her sit in the front with Dad. But she could only reach the pedals if she sat all the way forward on the edge of her seat. Then she got distracted with pretending she was Moana, going off to restore the heart of the goddess, Te Fiti. I was kind of enjoying my seat in the back. If I shut out the sound of my dad huffing and puffing, and Brianna belting out How Far I’ll Go, it was kind of relaxing. Until my dad told Brianna to switch seats with me so I could help pedal. And then…NOTHING!!! I couldn’t even move the pedals! I looked over and my dad’s pedals weren’t moving either!! But that was because he was ASLEEP!!! I don’t know HOW he fell asleep, because Brianna was still belting Moana songs at the top of lungs right behind us. “WE? !” I snorted to dad. But he was right—we were all the way in the middle of the lake. “Dad, I think something is wrong with this boat! For some reason, I can’t get the pedals to move!” I complained as I stomped on them with my feet. He frowned and tried his own pedals, but they wouldn’t move either. “Something must have gotten stuck in the propeller-thingy,” he explained. If the propeller was stuck…WE were stuck!!! But there weren’t. Mainly because it WASN’T A ROW BOAT. Brianna suddenly stopped singing. “Are we stuck?” she asked, her lip trembling. Brianna was about to go into a full-blown wail. Not a Moana-belting-at-the-top-of-her-lungs wail. But the kind with hiccupping and snot and enough tears to raise the level of the lake. Now THAT would be super convenient. My dad and I exchanged a glance. “Well, okay, Brianna! But, I think we STILL need to figure out what we’re going to do until that happens,” I explained. “We could paddle,” my dad suggested. “But there are no OARS!” I muttered. This was ridiculous! There was NO WAY it was working. But Brianna looked so hopeful. And, I was starting to get hot from the sun blazing overhead. So I got down and paddled on the other side. The edge of the boat was digging into my chest and I was barely splashing at the water. But Brianna whooped and hollered, “It’s WORKING! We’re almost there!!! I think the ocean is helping us!” Then she started singing even louder. We weren’t moving at ALL. We were NEVER going to reach the shore! We were going to wither away and die on a pedal boat in the middle of Lake Foster!!!! So, if you want to know if we ever got off that dang pedal boat, tune in next week for SHIPWRECKED!! – PART 2, and I’ll tell you what happened! Have you (or anyone you know) ever gotten stranded somewhere? I’d like to hear your exciting story. Have you ever rode on a boat and, if so, was it fun? Can you guess what happens next week in Part 2 of my adventure? OMG that sounds horrifing are u ok?